The Nighthawk's Nest | For we do not wrestle against flesh and blood, but against principalities, against powers, against the rulers of the darkness of this age, against spiritual hosts of wickedness in the heavenly places. Eph 6:12. For we do not wrestle against flesh and blood, but against principalities, against powers, against the rulers of the darkness of this age, against spiritual hosts of wickedness in the heavenly places. Eph 6:12. Over the years, I’ve been able to have some outstanding experiences due to pro wrestling. I had the pleasure of learning from and/or working with some of the very best: WWE Hall of Famers Hulk Hogan, Ric Flair, Dory Funk, Jr., Ron Simmons, Bullet Bob Armstrong, Barry Windham, Scott Hall, Larry Zbysko, and the late Big John Studd and Blackjack Mulligan. At the beginning, I was very fortunate to get to pick the brains of Bob Armstrong (who was a source of wisdom when I broke in) and Steve Keirn (who first suggested that I turn pro), both of whom exemplified how to be a pro every night. Other top men who shared the card with me (and I mean that in the sense of hospitality and welcome) included Dory Funk, Jr., Big John Studd (who called me to work on one of his last shows), the Exotic Adrian Street, the Armstrongs (Brad, Steve, and Scott), Glacier, Marty Janetty, and the late Nature Boy Buddy Landel. I learned something from them all. Once Dory Funk, Jr., nods at you and says “Good match,” when you come backstage, you know you did okay! I particularly want to single out a couple of people. 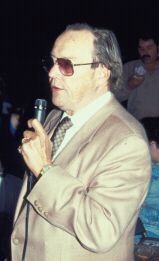 I need to acknowledge the late, great Gordon Solie, the “Walter Cronkite of Professional Wrestling,” also a WWE Hall of Famer. He took a lot of time with me, in person and on the phone, to talk wrestling, expose me to the major promotions, and give me a respect for the game. My first trainer, “The Man of 1000 Holds” Dean Malenko, (Pro Wrestling Illustrated’s #1 wrestler of 1997 — who ought to be in the WWE Hall of Fame) set me on the right path, showing me how to work “old school,” and rooted me in the basics at the very beginning. I hope you’ll enjoy the features on this site and visit it regularly. It’s dedicated to you, the fans, as well as every promoter who thought I’d add to his card, to every tag team partner that worked with me, and to every opponent, without whom thrilling matches would never happen. Please feel free to use the form below to submit any comments or questions about anything to do with “The King of Sports.” No spam guaranteed!